Since 1993, Avalon Glassworks has been a local source for hand-made gifts and décor. 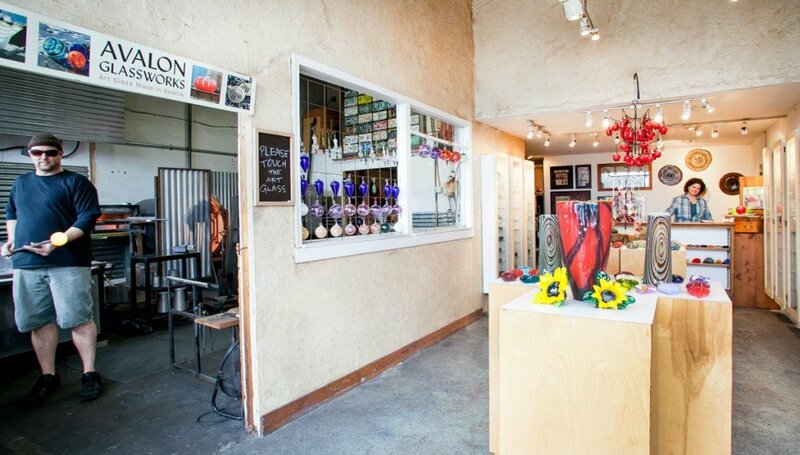 Straight from our West Seattle hot shop to you, we make our products on-site and sell directly from the adjacent gallery and online here. Come see it made! Connect with the artists, learn about the process, and see a piece start to finish. You will be able to stand so close, you can feel the heat. Check our glass blowing schedule for the best times to watch. It’s a free, very-Seattle experience. And we hope you’ll want to buy some souvenir art glass while you are here. Unique art glass gifts are our specialty. Our contemporary style of blown glass is heavily influenced by the Northwest landscape. Decorative vases, bowls, ornaments, and sculpture are colorful additions to your home or treasured gifts for weddings, birthdays, retirement, holidays, or the best reason: a gift for yourself. Find us in the vibrant corner of West Seattle called Luna Park, which is less than 10 minutes from downtown Seattle, near Alki Beach. For over 23 years we’ve shared the neighborhood with nostalgic diner Luna Park Café (epic milkshakes) and locally-loved coffee shop The Shack. Free parking is available in our lots or on the street. For more info, directions, or to order, email us or phone (206) 937-6369.